In this Incredible home located in Doylestown, Pa. we painted all the ceilings of the family room, kitchen, parlor, main entry foyer and second story level hallway, two coats "Brilliant White" The walls of the family room, kitchen, main foyer were painted two coats "Philadelphia Cream". The second story level hallway was painted "Celery", all flat in finish. The moulding was sanded, cleaned and painted one coat SW "Proclassic oil". The sheen levels are extrodinary and visible within the photgraphs taken. In the basement of this same home we created a stone block textured "old world" faux finish. Also, built a baseball trophy cabinet and constructed a three piece additional wall shelfing unit, both painted black. Removed bay window, reframed and installed new header for larger window, installed window. Installed two new windows in side wall were no windows were before. Installed all all new drywall, insulation, electric and high hat lighting. Installed 5-1/4 crown molding. Installed wood floor, Helped design and then created the new railing system with oak newewls, oak railings and iron spindles. Removed existing tile flooring and installed new tile flooring in foyer with design. Then we created our famous old world texture faux. IInstalled at main entry doorway and living room archway decorative mouldings and new larger base moulding and 3-1/2 door casings, througout. The Backsplash and under cabinet xeon lighting installed. Some marbelizing and something unique. In this turn of the century home we created and installed a large scale crown moulding and finished in high gloss oil. Repaired the ceilings and walls and skim coated and painted. All existing trim was painted in high gloss oil. The fireplace, which was decrative to the house was modified and a faux texture was created to give the fireplace more character. This Gilloti built home was customized with shadow box trim in the main foyer. We primed and painted two coats all walls and trim. Installed all new wood flooring, thresholds, new 6" base moulding, 3-1/2 door casings and decorative mouldings at entry and hall doorways. All chaulked puttied and painted two coats semi-gloss. This home we removed wall paper, oil primed walls, repaired ceilings, installed highhat recessed lighting. Removed all existing 3 inch ceiling crown and all base and door trim moldings and replaced with 6 inch crown and base and upgraded door trim to include custom molding trim around main entry door. We then created an "old world" textured finish with a base color of the trim and a translucent glaze finish, that exploits the texture finish. In addition we refinished the stair railing and spindles. Stripes for the Dining Room. A designer finish but not to compete with the texture of the other areas giving the dining room a rich elegence. New furnishings have been ordered for the Dining room and the Living and hallway areas. The mule posts, banister and treads of this staircase were cleaned, sanded and stained with a red oil polyurethane stain. The risers were then freshly painted . This spectacular home in Yardley was entrusted to us by the home owners to install crown moudling at the ceiling, create a unique eight piece custom shelf with dental molding and blocking, paint all wall areas, make repairs to walls and create a striping effect in the dining room as well as faux finish the four entry columns of the foyer with a marble effect....All while on vacation. Each night we posted pictures of our progress on this site for them to see. Samples were made of the shelving and basic samples shown of the striping and faux marble effects, prior to them leaving. As with anything adjustments need to be made in the field and the client was able to see visually what we were talking about. Technology! The client asked what do we need to do before we leave? We said, nothing at all, just enjoy your vacation. The rooms were cleared of most furnishings, tables, lamps, chairs etc. for our work to begin. Once completed all areas were cleaned, vacuumed, dusted and returned to there designated areas as if nothing happened. The client returned to a completed and clean home ready to enjoy. This beautiful home located in Newtown was painted inside complete by us. In the dining room we created a suttle faux marble type finish in oil, giving it a real natural shine and smooth blending. The colors used together are the flat outside border colors over an eggshell base of the lighter color. The trim was repainted two coats for a level and even sheen. The main entry foyer ceiling we created a little more dramatic marble effect with veining and multiple colors within the tre ceiling. Here again, we changed the color of the wood banister handrails and posts with a high gloss clear polyurethane stain and blend mix so the original wood grain is still seen just a lot more dramatic. In this two story main foyer we removed wallpaper made repairs and oil primed. All existing 3 inch molding was removed and replaced with 6 inch crown molding and base along with focal point freeze and pilaster columns at the entry ways to the dining, parlor and main entry door. We left the upper crown molding in the foyer and added a 1 inch sculpted molding 3 inches below to create an illusion of a thicker molding.Base coated walls in an eggshell 2 coats. Primed all wood spindles of staircase and painted 2 coats. The banister and treads were sanded and re-stained in a custom blended polyurethane gloss. Painted all molding in a semi gloss finish. We then created a three color faux finish on the walls and will be applying another glaze over the finish for added depth. The adjoining parlor and dining room we also removed all existing moldings and replaced with larger scale molding. Painted all surfaces in an eggshell finish with the ceilings flat. In the parlor we created a strie finish with a dark gold base and a two shade lighter glaze strie. This home in Yardley we updated and faux finished and refinished floors. All existing hallway doors and trim was removed along with all existing 3" basemolding. The bedroom floor was refinished and sealed with three coats of gloss urethane. New six panel grained doors were installed with new casing molding of a wider profile. New 6" base molding with shoe base was then installed. New 6" crown molding with blocking was installed in the bedroom and painted two coats semi-gloss. A french glass door was installed and then finished with a high gloss urethane finish. In the bedroom we created a suede faux finish. All new doors, trim and base molding were finished with two coats semi-gloss. In this home in Buckingham we constructed a shelf twelve inches wide with 6 inch crown molding and sculptured blocks with columns at the wall and pitched ceiling. Having already removed the existing three inch baseboard we then installed a 6 inch sculptured base molding and mitered the base around the columns to increase the column effect. We then attached 4 inch wide planking along rectangular ceiling out line. Similar size planking as the ceiling was then cut and mitered down the pitched ceiling to the shelf. Finally, cut sculpted one inch trim molding around column tops to add that extra detail. Another detail was added to the face of the shelving with a beaded 3/4 inch molding. The construction was then puttied and caulked and just shed project once painted. In this bathroom we intalled a 1-3/4 base trim around the perimeter of the room and cut and attached a 2 inch wide cap molding and rounded corner edges. quarter inch thick and 1-1/2 wide molding strips were spaced vertical from top molding to tile base. Chaulked and puttied and just waiting for color choices. At Station 55, Newtown Fire Association, we created signage for the station with a textured stone look on existing wall area and marbleized background for lettering background with veining. We then installed crown molding top and bottom with blocking. Within the bottom crown molding we installed cord lighting which lights up the faux work and lettering. The emblem in the center was proportioned to fit and supplied to us by the apparatus manufacturer as a sticker. We then cut plywood to fit the scrolled dimensions and placed with it sitting several inches from the wall area. In this fantastic home we painted the walls, ceiling a flat yellow/tan and below the chair rail we created a mulitiple sponge faux techique finish and painted all the trim in a pearl finish. The ceiling area was one solid color from our original paint job when constructed. We painted the interior square areas the same color as the walls. This custom home was originally painted by us complete in 1999 as new construction. In this kitchen we started out with the homeowners removing wallpaper and preping the walls and also installing crown molding and plinth blocks and larger scale trim base primed, themslves. Nice job! We then created a textured old world style finish and painted in a eggshell finish, a yellow/tan, we then applied a glaze of a desert beige color and exposed the detail in the textured finish. The next day we painted all the trim a creamy white semigloss. Faux stone wall. Each stone, approximately 18"x10", is hand-trowled, giving each stone a unique identity. The stones were then individually colored. Here we where given full creativity. A complete redo of a main entry foyer. We started with lighting as the most important part to our final finished product, installed by a certified electrician. Stipping wall paper, oil primed and skim coated walls. We installed "Focal Point" architectual products 5-7/8" crown molding with decorative corner blocking and painted cameo white. We then painted the walls a soft eggshell yellow. We then treated the doorways with pilasters and head treatments. The walls were then glazed and bagged with a orange pumpin hue oil glaze somewhat transperent to reveal the background soft yellow. was treated with "focal point" dental crown moulding with corner blocking. In the area where the ceiling pitched we built a shelf for the moulding to sit, creating more uniqueness to the area. The door frame trim work was replaced with fluted moulding with corner blocks and base blocking. We replaced the standard doors with french glass doors. The base moulding was left as is and we added a thin fluted moulding 3 inches up the wall to give the illusion of a larger base to fit proportionately to the room. The walls were painted summer sage in an eggshell and the trim was painted cameo white semi-gloss. The pitched ceiling was faux painted to give a cloudy effect using the colors of the selected chair material. 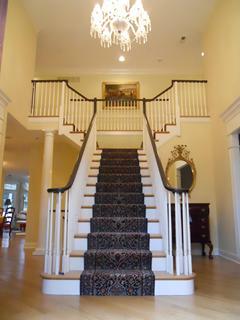 In this main entry foyer we added crown molding with blocking along second story ceiling as well as ground floor hall. We also added decorative trim to trimless entry ways. Below the chair rail we base painted in an eggshell tan and created an oil glazed bag finish. This same faux finish was done in the family room two story wall. The adjacent rooms off the main entry foyer were painted in an eggshell gold color with white trim throughout. Constructed a shelf, in a boys room, using 6" crown molding with unique blocking and painted two coats. The room was then painted with the green above shelf in a semi-gloss latex green and the wall areas painted in an eggshell finish grey. This property we completed unfinished work from another out of town contractor. We completed various carpentry including two cabinets installed and retro fitted kitchen island with wood panels. We sanded primed and painted all the cabinetry in an oil gloss with a brush layed flat. The oil gloss has a glass like shiny smooth finish. The cabinetry was painted by the former contractor in a semigloss latex and rolled the finish. We also painted all crown moulding and trim. Completed tile work and created custom thresholds and custom made wood threshold for an entry door. Attached cabinetry hardware. Changed a light fixture, put up a fan, installed a doggy door, put together furniture pieces, Installed additional fencing around the rear fence area (250 lf), Installed a door bell, attached face plates, hung a mirror, and some other things I can't think of at the moment. In addition we were given the oppurtunity to complete and improvise a basement laundry area using materails existing in the basement to create a functional and ussable area with plenty of storage. In this kitchen we removed a non structural beam that divided the kitchen to the eating area. An accoustical drop ceiling lied on top of the cabinetry with flourescent lighting units. Once removed we had alot of ceiling drywall repair. We intalled high hat light units and relaminated the countertops and cleaned and urethaned the cabinetry in a high gloss oil. Primed and painted entire room. Next we installed undercounter lighting and lighting on top of the cabinetry.